This gig is designed to create awesome App Icon for APP STORE/PLAY STORE for your smartphone application as It is very important to have a wonderful first impression on people when they visit your app page on play store or App Store. Having a good first impression drives higher conversion rate for downloads. 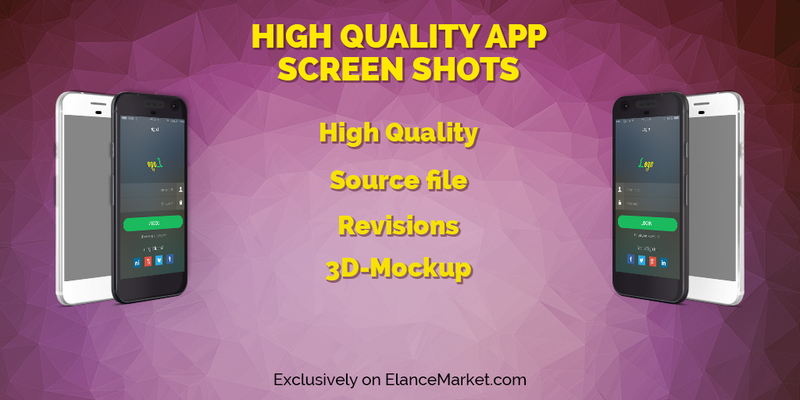 We will design amazing app screenshots for your app. Having a good first impression drives higher conversion rate for downloads. We will design the screenshot from your app to this model of design and make it look beautiful and futuristic. Just hit order button and send screenshots of your app along with text you want. Upto 6 Mock Up graphics for a device/resolution of your choice, depending on the package you choose. Full Support for the Client ! Note: You can also contact us before placing your order to know more about the service and the extra, to make your first impression even better.